2 Euro Gedenkmünzen aus Lettland. Lettland hat seine erste 2 Euro Sondermünze in 2014 geprägt. 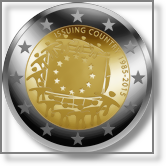 2 euro commemorative 2015 from Letonia. 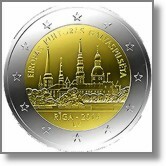 "30 years of european flag"
2 euro commemorative coin from Latvia with motiv EU presidency.